Looking for yarn at my first TNNA, I really did not know where to begin with wall upon wall of GORGEOUS yarns of every color, weight, and fiber everywhere I looked. I was instantly drawn to the hand dyed yarns, but knew those were not ideal for a book filled with afghans. On the other hand, when Sabrina of Anzula looked at the colors they had on hand for yarn support and handed be a full bag of each of 3 new colors of their For Better or Worsted (Cashmere/Merino/Nylon - yum! 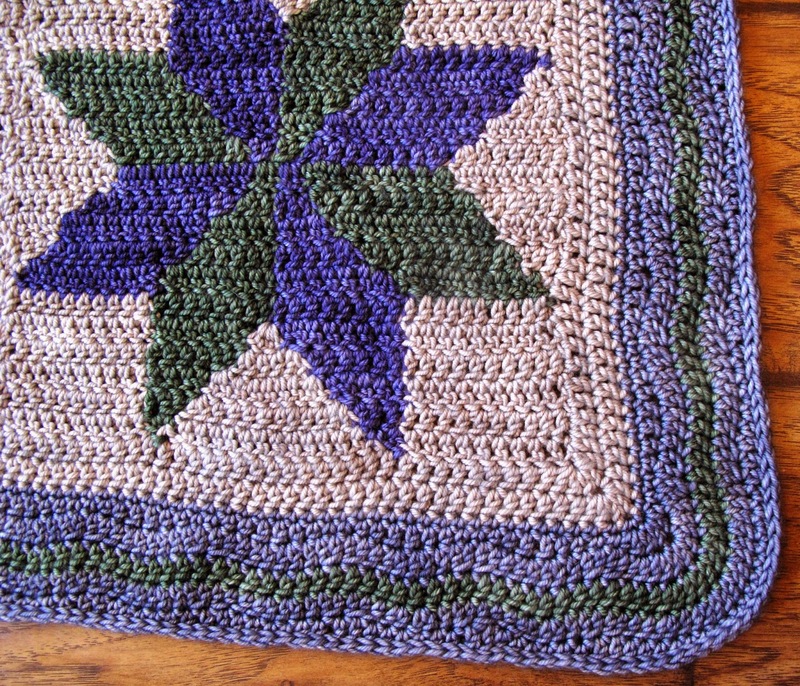 ), I was excited to fit those colors into one of the afghan layouts I was planning. I looked over the various layouts, and chose this one because it is the only one where all of the squares require only 3 colors. But when I began swatching up the 3 gorgeous colors, I realized that the colorwork just was not going to show up in three dark colors. 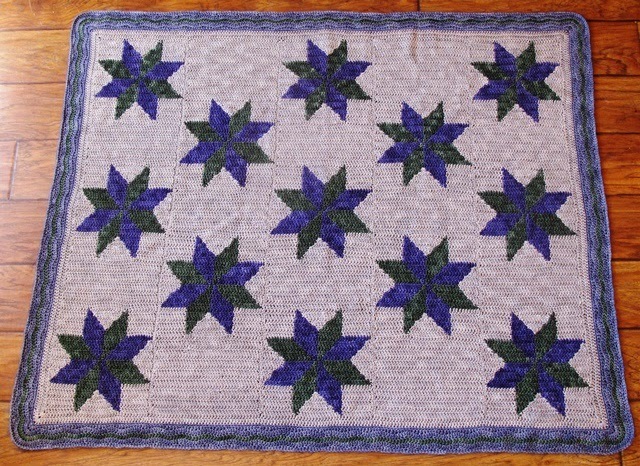 I ended up requesting a fourth color for a lighter background with green and purple stars, and used the darker grey for the border, with a wavey "ribbon" of green running through it (like the quilt below). Could not locate source for this pic, please let me know if it's yours. 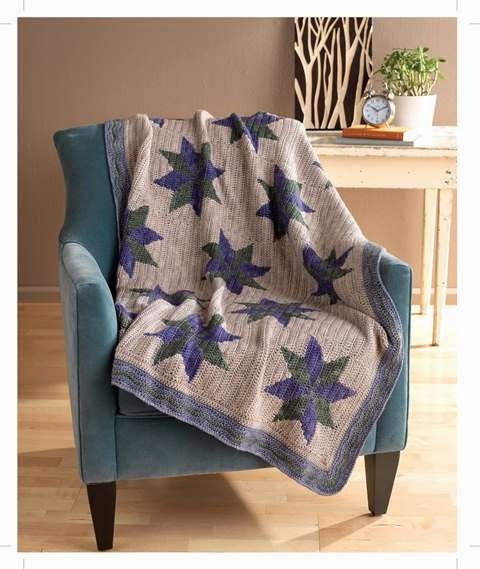 I spent many hours online looking for quilt pattern ideas, as I love seeing how traditional quilt blocks can be used in different combinations of color and repetition to create marvelous effects. This black and orange quilt was the inspiration for "Clouds Removed". 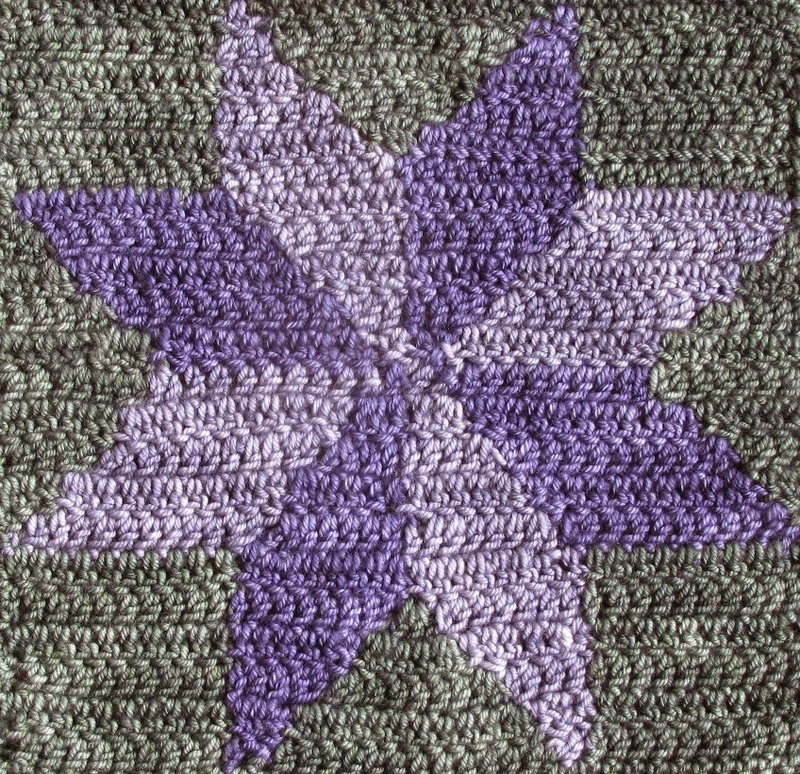 Although I decided to use the "Eight Pointed Star" block, rather than the block used in the quilt, I included suggestions in the book for doing an alternative layout with the "Double Friendship Star" (like the quilt). Many of the designs in the book include alternative design suggestions, as I hope crocheters will make the projects their own, and cannot wait to see what they will do with my designs.